Passive income, is by far, my favorite way of making an income on Etsy. It doesn’t require shipping or keeping stock and it is a business that I can predominantly do on my own time. Not to say that a lot of work doesn’t go into running a passive income generated business on Etsy. Even selling digital products is not 100% passive. There are different steps one must take in order to be successful. However, the truth is that you will make money while you sleep. You really will. Which is why generating passive income on Etsy is a must when starting your own online business. You provide your customer with a digital product that they want or need and they, in turn, pay you for it. The product is electronically delivered to your customer and your job is mostly done. Aside from answering the occasional customer question or email, it really doesn’t require a ton of upkeep. Well, that’s not entirely true. There is a lot of work that goes into building a successful passive income generated Etsy shop. The “if you build it, they will come” mentality does not ring true here. Or maybe anywhere for that matter. But a lot of the work occurs on the front end during the designing stage. And then again during the marketing and promoting stage of your business. I will talk more about that in a later post. Passive income is defined as any regular earnings from a source aside from that of an employer or a contractor. The Internal Revenue Service (IRS) says passive income can come from two different sources: rental property or a business that one does not actively participate in. For me and for many other bloggers and small business owners, passive income, in relation to a product, is created by the selling of digital products, stock photos and/or online courses. So what does this mean in terms of selling and making a passive income on Etsy? Here are 10 product ideas that can help get your wheels turning. The possibilities really are endless. So, y’all…let’s get started. Stock Photos/Images: I have a distinct love and passion for photography. I am a documentary photographer so most of my images are ones capturing real life moments caught on camera. I started selling stock images last year and am still amazed every time one of my photos sell. These are all photos I had stored on an external hard drive in my office and now they are creating a stream of passive income for me. Others may focus on styled stock photos selling to fellow bloggers and small business owners. The possibilities really are endless. Printable Wall Art: Printable wall art was and still is something that I sell in my Etsy shop. I have had several Etsy shops over the last couple of years, selling over 2,000 digital downloads collectively, and much of what I have sold is printable wall art. Great options for printable wall art are children’s wall art, quote wall art, inspirational wall art and really anything that you feel would have an audience. Check out Pinterest or Instagram and find visual inspiration for your designs. Never copy anyone else’s work but finding visual inspiration can really get your creative juices flowing. Inspiration can be found in beautiful color palettes, home design, fashion or even food. Printable Stickers: Stickers, in general, are all the rage right now. I know many very successful Etsy sticker sellers who are running their business full time. There is also a great demand for printable/digital stickers. Some people prefer to do all of the hands-on work themselves, in order to save on product costs and shipping. Others want to use the stickers in their digital planners or journals. So if you are looking for a great way to generate a passive income on Etsy, printable/digital stickers are a great option. Greeting Cards: Who doesn’t love greeting cards? The truth is, digital greeting cards are timeless and will forever be a sought after product. The great thing about digital greeting cards is that they provide two possibilities: send your greeting card electronically or print at home or at your local print shop and send it via mail or give to your recipient in person. Your customer base could be anyone with either of these needs. Invitations: This is something that I, myself, even as a designer, have purchased on Etsy time and time again. Because sometimes we just can’t do all the things. With printable invitations, these can be completely passive by allowing customers to edit the design themselves as done in an editable PDF or you can offer to include customizable options in your etsy shop. This creates a product that isn’t as passive as some of the other options here but is still a great way to make money and grow your business. Printable Planners: If you haven’t yet noticed, printable planners are HUGE right now. I, myself, have created and sold my own printable planners over the past 4 years and have sold hundreds. The market is fierce but if you feel that you can bring something new to the table, then, by all means, give it a shot. Another less saturated option for designing planners in order to generate a passive income is by designing digital planners as used in apps such as GoodNotes. Clipart: Oh clipart, you have my heart. When it comes to drawing or creating clipart, I am always looking for those much more qualified than myself. My stick people still need some work. But if you can draw or create digital clipart then girl, GO FOR IT. As a business owner myself, I am always looking for talented creators of clipart. This is one gig that will never go away which is why it is the perfect product for selling on Etsy and creating a passive income. SVGs: Funny story….my mom called me a few years ago and told me that SVGs were where it was at. I knew she was probably right but my plate was overflowing with babies and life in general so I never took the leap into the world of SVGs. Now, I see SVG sellers who have made it to the very top of the Etsy sellers list. Ouch. Moral of the story is, listen to your mama. And if you want to make passive income on Etsy, then start creating those SVGs, y’all. Mockups: Ohhh mockups, my business wouldn’t be the same without you. Seriously?! If you have an eye for this sort of thing then by all means, what are you waiting for? This is a product that is less saturated than some of the others. And because of the number of growing bloggers and small business owners, this product is sought after ALOT. Branding Kits: Everyone is aware that branding is huge when starting a new business or when revamping your old one. But not everyone has a keen eye for branding. If you feel that this is something that you would be good at though, then creating branding kits is a great niche to get into. And once again, it is primarily passive, unless you choose to offer customizable logos within your kit. There you go. If you are a blogger or small business owner, then passive income should definitely be on your radar. And because Etsy already has a well-established platform, it is the perfect place to get started. 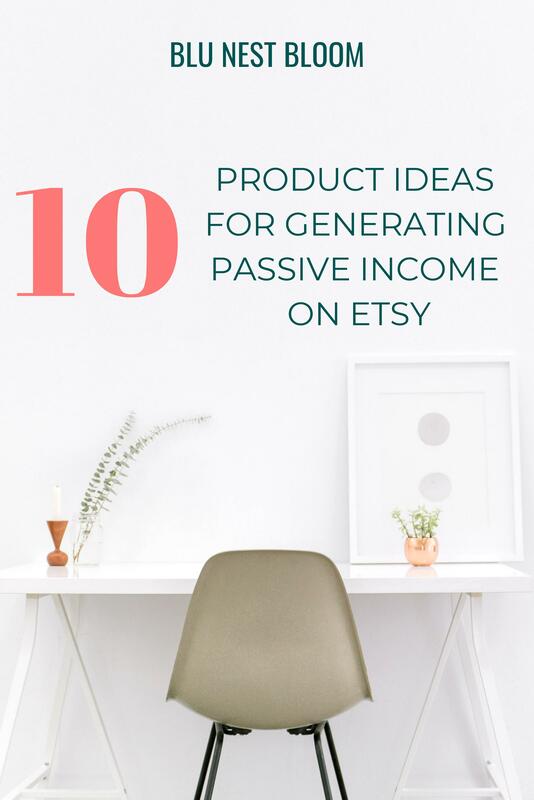 Do you already make passive income on Etsy? If so, what do you find to be the best ways to grow your passive income business?